Arlington’s Listed FLBC4580 IN BOX™ Cover Kits install receptacles, flush, in a 4.5"concrete floor box. 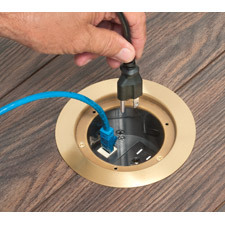 The brass-plated or nickel-plated metal covers have ultra-thin, stamped steel flanges that deliver flush-to-the-floor receptacle installations. Recessed covers install into the box, reducing trip hazards caused by plugs. Easy to install, they come with a divider for power and low voltage in the same box.